Pack o' pre-teens checks out SlowBoat at the town marina. Last night we stayed in the marina in Spanish (yup, that’s the name of the town), where a crowd of children goozled the boat. 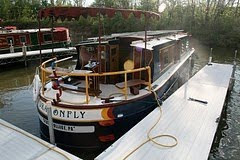 A solar-powered canal boat. Now how exactly did the Captain get the idea for THAT? Mostly I think it was the flat roof—acres of real estate, just begging to be gainfully employed. 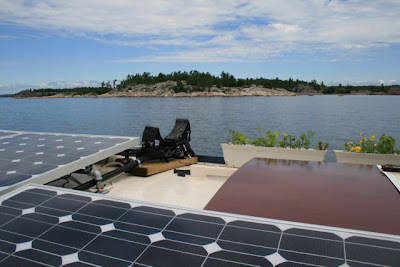 Cruising along, we keep our eyes open for OTHER boats that use sustainable technologies--particularly solar panels. We get the impression that solar is quite popular, both on sailboats AND powerboats. We got independent confirmation of this idea when we docked in the town of Brit, back in Georgian Bay. Michael Kelly and his wife stopped by to say "hi." Kelly works for a company that specializes in marine electronics. “Everyone wants solar panels now—that’s a huge part of our work,” he said. Tonight, for example, we’re anchored in a narrow, curved bay behind Turnbull Island (thanks for the suggestion, Roy! ), about 15 miles west of the town of Spanish. 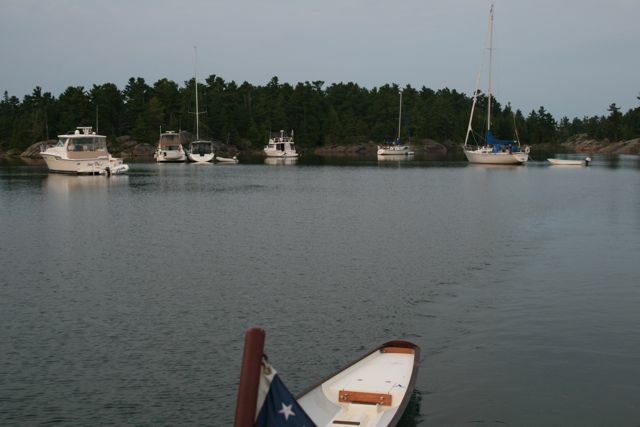 Once we got the anchor down, we did the boater’s paseo—the evening promenade, by dinghy, among the other boats. One sailboat was running a generator—the low drone an aggravating noise in such a lovely remote place. But another sleek 35-foot sailboat was silent, with two large solar panels on a rack above her stern canopy. 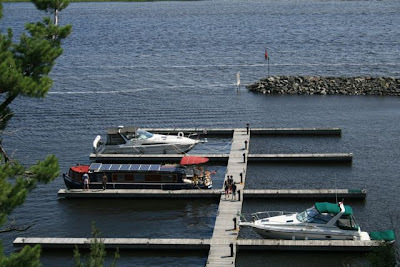 Now, if instead of anchoring out you stay at a marina, near a town (the boating equivalent of pulling your Winnebago into a KOA), part of the package is “shore power”: electrical stanchions on the dock. You run a big, fat, yellow waterproof extension cord out to the stanchion, plug it in, and presto, you have power . . . for your lights, fridge, computer, to recharge your cell phone, run your water pump so you can shower . . . you get the picture. So you can imagine, when you anchor out, even the most minimalist use of electricity, on the tiniest sailboat, drains the boat’s "house" batteries pretty fast. That’s why many boats have generators. While “anchoring out,” it’s often part of the boater’s routine to run a “gennie” for two or three hours, charging up a battery bank to power all the comforts of home. Enter solar panels. Michael Kelly told us most of the solar installations HE oversees are to power boat fridges and freezers--and sometimes a big-screen TV. Soon after his visit, a petite woman stopped by the dock accompanied by a fluffy black lapdog; like Kelly, she was excited to see our solar panels, and she wanted to tell us about hers: four big panels recently installed on her own 48-foot-long DeFevre (translation for non-boaters: a very large and very comfortable powerboat.) “Those panels run ALL our house electrical,” she told us, with evident satisfaction. "No more noisy generator." Hard on her heels came another boating couple who told us THEY had just installed four solar panels and a bank of six large batteries on THEIR powerboat; and immediately afterwards a young woman came by enthuse about our solar panels and the brand new, small panel on her sailboat that now powered her laptop. Right now our half-ton battery bank is for propulsion only; we pull power from the batteries to run the electric motor. 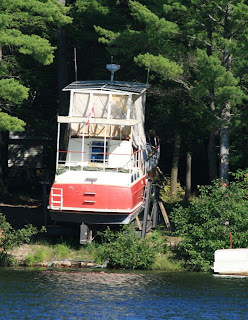 We do have a pretty powerful “house” battery, which is recharged by the engine's alternator when we are running on diesel, and by shore power when we're plugged in. So when we anchor out, we’re conservative: We turn down the fridge, we use the LED overhead lights Bill installed (they use hardly any electricity), instead of incandescent ones, and we’re careful how much time we spend using our computers. We COULD wire up the boat to use solar power for these applications. 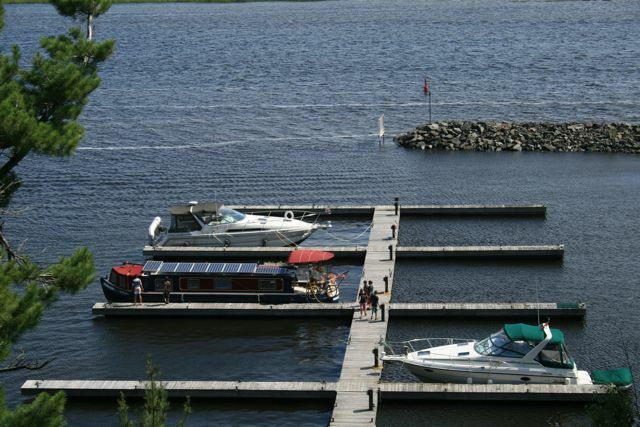 We’re just not sure if there would be enough power for both cruising AND anchoring out. But it's possible. Stay tuned. How does this OTHER boat do it? Read further, and the article confesses, “Despite the ‘clean propulsion’ sales pitch, you don’t really reduce your carbon footprint.” This boat’s electric motor is powered by either 1) a diesel generator that stashes power in a big ol' battery bank or 2) the battery bank, charged up by shore power. The price tag for your “green” cruising experience, by the way, is a mere $5 million. Okay, okay, this boat’s a little fancier than ours: It's 70 feet long, 23 feet wide, with teak decks and leather sofas standard, "sunbathing area" on the foredeck, and galley with side-by-side fridge, four-burner Bosch cooktop, and Miele dishwasher. I DO think it’s noteworthy . . . and quite a positive development . . . that the cover story in a magazine for powerboaters sells the IDEA of quiet, zero-emissions "green" boating . . . with all the comforts of home. Now I must leave MY sunbathing deck (a folding chair on the stern) to cook OUR gourmet dinner with ingredients from my dorm-room-sized fridge. When dinner is over, the onboard dishwasher will take care of clean-up; he's quiet, energy-efficient, complements our boat's decor, and runs on a cold can of beer. I have a similar dishwasher that runs on a cold can of pepsi!